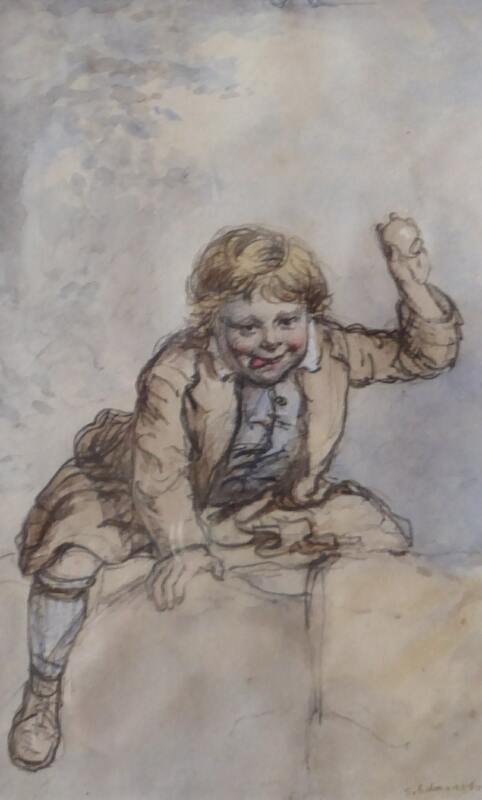 This is a lovely little study of a young Scottish boy who is shown sitting on top of a wall and throwing fruit. He has obviously been into an orchard and has climbed over the wall. He is shown pelting people going by with apples. He is certainly concentrating on hitting the target as his little pink tongue is sticking out as he takes aim. A light sketchy impression of trees in the orchard is seen in the distance. The laddie is dressed in typical Scottish rural garb - with a little waistcoat under his rough tweed jacket - and he wears a simple kilt above the knee - which shows off a little woolly stocking on his leg and lace-up Highland brogue. He has his little pouch in front of him on the wall - where he has stored his fruit. 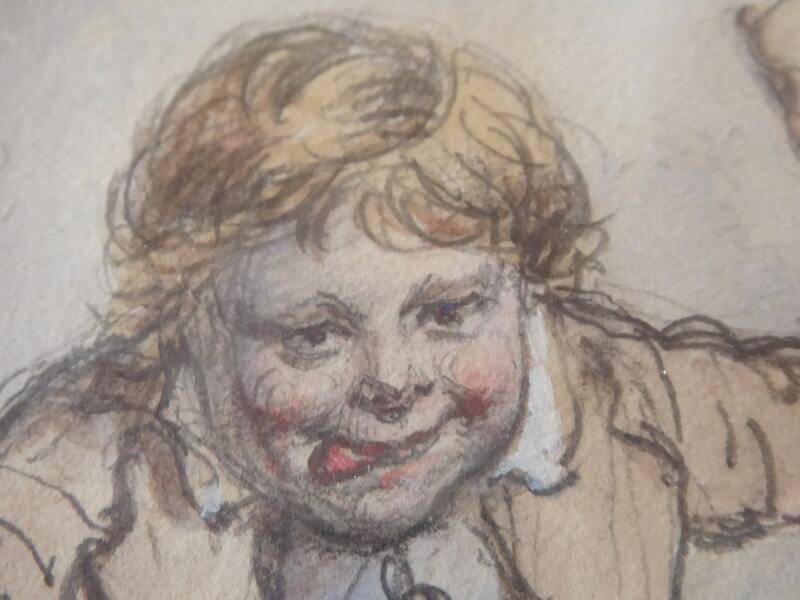 It is certainly an accomplished study and typical of the artist - who has successfully captured both the expression and the feeling of motion of the little boy. The study is signed lower right: S. Edmonston, and it is drawn in black chalk with touches of coloured chalks. 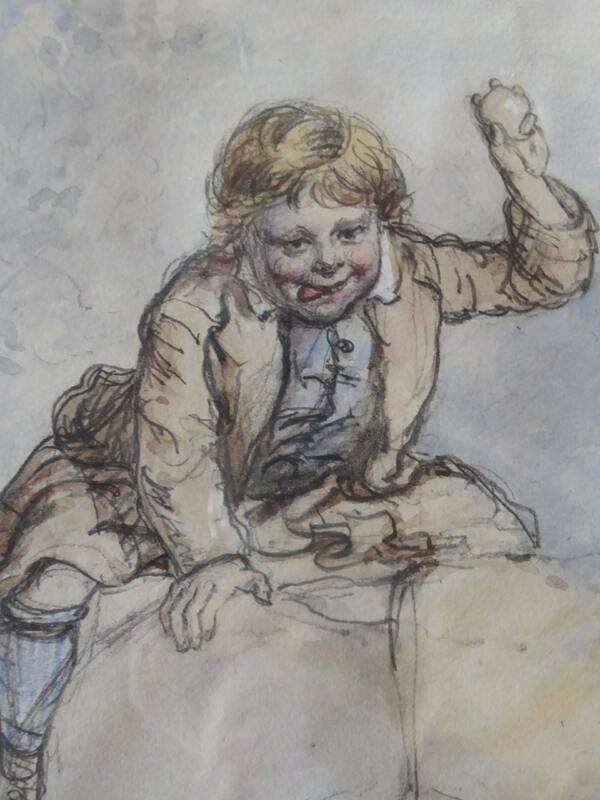 The drawing is by a listed Victorian Scottish artist - Samuel Edmonston. Edmonston was born about 1825 in Edinburgh. He studied at the prestigious Trustees' Academy from 1854 - 1853 under the tutelage of William Allan and Thomas Duncan. He specialised in these type of pictures depicting Scottish rural life, and although achieving considerable success and national reputation in his own lifetime - today, he has become sadly neglected as an artist in Scotland - due to the fact that late in his life he emigrated to the USA. He exhibited twice at the Royal Academy, London in 1862 and 1864; but kept almost all of the best work to show at the Royal Scottish Academy in Edinburgh. He exhibited a total of 106 works there between 1845 and 1887. He also exhibited 11 works at the Glasgow Institute. Edmonston has three drawings in the collection of the National Gallery of Scotland. 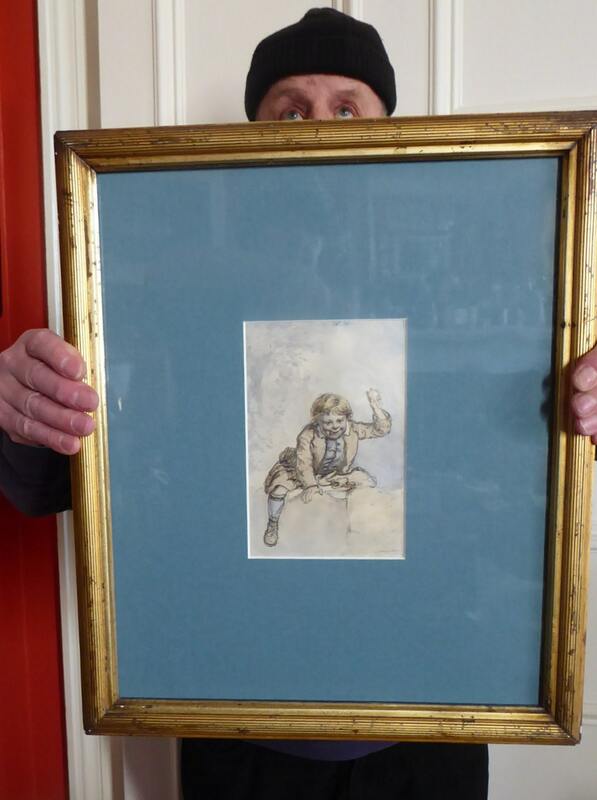 My charming drawing is in good condition and is mounted in a grey-blue mount. It is being sold framed - and comes in its original antique frame - perhaps in slightly shabby chic condition - but would still look great hung in a period interior. The drawing measures: 17.5 x 11.5 cm. The frame is 46 x 38 cm. We could post outside of the UK - but obviously, to do this we would have to remove the drawing from the frame and remove the glass. Please get in touch with me if you wish a postage quote.